When the weather heats up, a new ENERGY STAR certified room air conditioner can help you keep your cool AND save energy! In fact, ENERGY STAR certified room air conditioners use 10 percent less energy and, on average, cost less than $75 per year to run. NEW! Room air conditioners with variable speed technology can now earn the ENERGY STAR label. Certified room air conditioners with variable speed technology save even more energy and quietly regulate the temperature, giving consumers the innovation and energy savings they desire in a state-of-the-art room AC. Room air conditioners that have earned the ENERGY STAR are available from brands including Arctic King, Danby, Friedrich, GE, Kenmore, LG, and many more. ENERGY STAR certified room air conditioners come with better materials and clearer instructions to improve sealing and insulation around the unit, so costly and uncomfortable air leaks are minimized. receive feedback on the energy use of the product. These products are also 'smart-grid ready', potentially allowing you to take advantage of special energy bill savings programs some local utilities are starting to offer. If all room air conditioners sold in the United States were ENERGY STAR certified, the cost savings would grow to more than $350 million each year, preventing more than 6 billion pounds of greenhouse gas emissions annually – equivalent to the emissions from over 570,000 vehicles. Room air conditioners originally qualified for the ENERGY STAR label in October, 1996. ENERGY STAR certified room air conditioners are 10% more efficient than non-certified models. 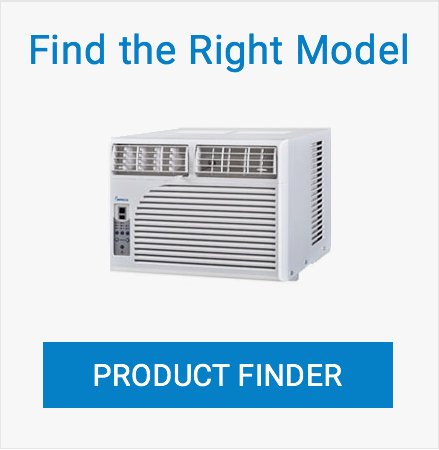 What else should I look for when buying a room air conditioner? Remember that bigger is not always better! 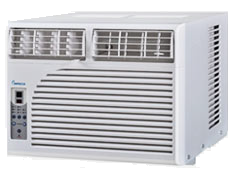 Buying an air conditioner that is too large does not provide better cooling. An oversized air conditioner is actually less effective — and wastes energy at the same time. Make sure your unit is properly sized. Room air conditioner models with variable speed technology can now earn the ENERGY STAR. In a conventional room air conditioner, the compressor works either at maximum capacity when the room thermostat calls for cooling or off when the desired temperature has been achieved, typically alternating frequently between full on and off. Room air conditioners with efficient variable speed compressors are able to vary the speed of the internal compressor motor in order to continuously control the temperature. As a result, the capability for efficient variable output allows a room air conditioner to more quietly regulate the temperature and save a significant amount of energy during operation. Room air conditioner sizing is all about matching the room size to the air conditioner size. A unit that is too big will be less effective and offer reduced air conditioner efficiency. Air conditioners remove both heat and humidity from the air. If the unit is too large, it will cool the room, before it has a chance to remove the humidity. The result will be a room that's not very comfortable to spend time in That cool moist air will make the room feel damp and clammy. The most energy efficient air conditioner is sized to the square footage of the space to be cooled. Getting the right size means getting the comfort and the energy efficiency right. Determining the floor square footage of the area to be cooled takes simple math. Just use the following formulas. 9 in = .75 ft.
6 in = .5 ft.
3 in = .25 ft.
For example: 12 ft., 6 inches, is 12.5 ft. Multiply the full length of the room by its width. Multiply the length of the area by the width and divide by two. Sub-divide into squares, rectangles and triangles. Then use the formulas above to determine the total square footage. If the shape of your room is more complex, ask your sales associate where you plan to purchase your air conditioner to help you determine the square footage. With the cooling capcity chart, find your room's square footage in the "Area To be Cooled (square feet)" column, then use the "Capcity Needed (BTUs per hour)" column to choose the correct cooling capacity for your room air conditioner. Cooling capacity is shown in British thermal units (BTUs) per hour. If the room is heavily shaded, reduce capacity by 10 percent. If the room is very sunny, increase capacity by 10 percent. If more than two people regularly occupy the room, add 600 BTUs for each additional person. If the unit is used in a kitchen, increase capacity by 4,000 BTUs. Consider where you install the unit. If you are mounting an air conditioner near the corner of a room, look for a unit that can send the airflow in the right direction. When the weather heats up, make the cool choice of a new ENERGY STAR certified room air conditioner. You’ll get the coolest comfort while you save energy and help protect the environment at the same time. New ENERGY STAR certified room air conditioners come with better materials and clearer instructions to improve sealing and insulation around the unit so they greatly reduce air leaks and save you more on energy bills – costing less than $75 per year to run! Some models even come with smart functionality offering you even more control to turn off the unit remotely using your phone or computer, and more. So make the cool choice today and chill out this summer! Cool for you. Cool for the planet. OVERVIEW: Learn why an ENERGY STAR certified room air conditioner is right for you. 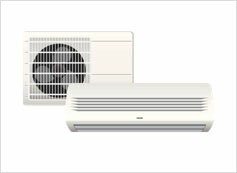 SPECIFICATION: Find out what makes a room air conditioner ENERGY STAR certified. BUYING GUIDANCE: Get helpful information to choose the right room air conditioner and make your home more energy efficient. Pledge to choose an ENERGY STAR certified room air conditioner. If all room air conditioners sold in the United States were ENERGY STAR certified, the cost savings would grow to more than $350 million each year, preventing more than 6 billion pounds of greenhouse gas emissions annually – equivalent to the emissions from over 570,000 vehicles. If all room air conditioners sold in the United States were ENERGY STAR certified, the cost savings would grow to more than $350 million each year, preventing more than 6 billion pounds of greenhouse gas emissions annually – equivalent to the emissions from over 570,000 vehicles. Looking for ways to save energy at home? My ENERGY STAR makes it easy to browse energy saving tips, and to see how your actions can make a difference. Here are a few tips to get you started.